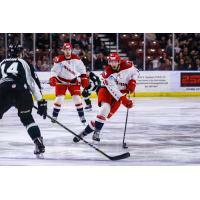 Allen, Texas - The Allen Americans, ECHL affiliate of the San Jose Sharks, finished last week with a perfect record of 3-0-0 with road wins in Idaho, 2-1 in a shootout on Wednesday night and back to back wins in Utah, on Friday and Saturday. The Americans continue their longest road trip in team-history this Wednesday night in Rapid City, followed by Saturday and Sunday games in Colorado against the defending ECHL Kelly Cup Champions, the Colorado Eagles. - Alex Guptill has 35 points in 36 games with Allen this season. - David Makowski is ninth in the league in plus/minus at +27. - David Makowski is fifth in the league with 41 assists. - David Makowski is third in the league with 18 power play assists. - Allen leads the ECHL averaging 21.25 penalty minutes per-game. - The Americans are outscoring their opponents 63-44 in the first period. - Allen is 23-5-1 when scoring first. 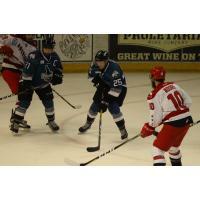 Allen Americans vs. the Idaho Steelheads�? ?